I am myself surprised that there are so many examples of round traditional houses. Round houses will continue to provide a lot of material for this blog. 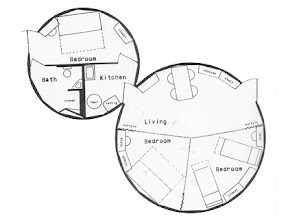 Yet there are few modern examples of circular houses: Buck Fuller’s Dymaxion is a case in point: it is marvel of fantastic ideas, all in one house, but one of its failures is that it just half-tackles the issue fitting in more rooms; and then, it doesn’t try to answer at all how these houses assemble together to form neighbourhoods, towns and cities. This is the great advantage of rectangular houses and rectilinear grids: rectangular houses are easily partitioned into smaller rectangular rooms; the house can grow by attaching new rectangular rooms to the existing structures; two rectangular houses can be built next to each other in a regular arrangement. 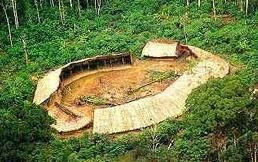 This is the theory as to why the pre-agricultural Natufian civilization, which probably built the world's first houses, moved from circular to rectangular houses. Urbanization, having high numbers of people living next to each other, meant individuals had to accept greater limits to their freedoms. When an authoritarian power could decide that a town would have a regular layout, the orderly form of the rectilinear grid proved itself not only amenable to central planning , it was also convenient to the individual householders. This was something they could live with. In the Harappan civilization of the Indus Valley, the cities were not all laid out in a perfect orthogonal layout. They were not all centrally planned; they have been described as semi-grids. Semi-grids perhaps evolved as a matter of a convenience, where a series of rectangular houses are added on, one by one, along a path. 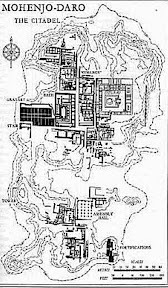 Perhaps Mohenjo Daro’s grid was not imposed by a dictator! There have been rulers who imagined and then built for themselves round cities. The structure at the centre of the circle is given prominence. But the houses themselves are not round. 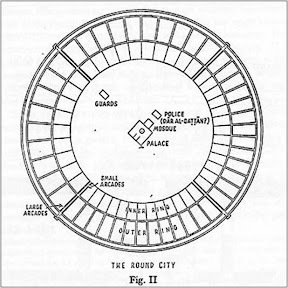 In the Round City of Baghdad they were rows of buildings that form a circumference of the circle. Such buildings are inflexible - not easy to plan and build. In Circleville in Ohio, US, the citizens found the shape a nuisance and increasingly ignored it as the town grew. 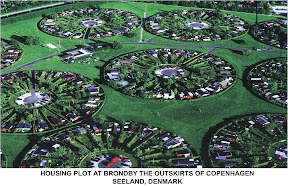 In Denmark near Copenhagen is an interesting example of a circular neighbourhood. No round houses here, and furthermore, the neighbourhoods don’t relate to each other in a circular geometry. Not much of an improvement from the Yanomamo. Round houses in a round neighbourhood in a round city in a round planet. This fanciful idea does not work! But I guess that I am different than alot of the world. Round in a house gives me an idea of freedom and security. Round demands more space around it! Society has always been square this and square that. Add a few triangles and you have a home. To me the road that curves out of sight is a road to a new land! The road that goes straight out in front of you never leaving your sight, means that you stay in the same old land. I am the kind of person who can see where that curved road goes, maybe that is why I follow it! May all your wishes become true in New Year!